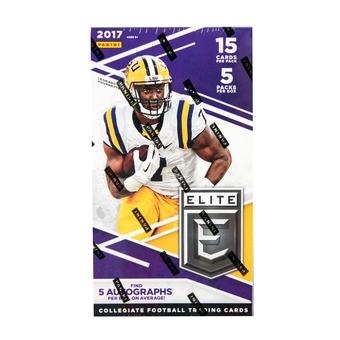 2017 opens up with Panini Elite Draft Picks which makes its initial foray into the collegiate football ranks! In Draft Picks you'll find an extensive checklist with rookies, rookies and more rookies from the upcoming 2017 NFL Draft! Includes autographed versions seq. #'d from 99 to 1! Find the following autograph inserts: College Ties Autographs, Alma Mater Autographs and the legendary Passing the Torch Autographs! Chase rare autographs of legendary college gridiron stars in their college uniforms in Alma Mater Autographs! COLLEGE TIES AUTOGRAPHS: College Ties Autographs features autographs pairing two rookie collegiate teammates or two players from the same alma mater! BASE: Find all of your favorite current NFL stars in their college uniforms! PASSING THE TORCH AUTOGRAPHS: Passing the Torch Autographs returns to college providing high profile signature combinations from past college greats! ALMA MATER AUTOGRAPHS: Exclusive 15-card autograph insert loaded with College and Pro Football Hall of Famers! ASPIRATIONS: Look for the colorful Aspirations parallels to the base set including Aspirations Purple, Red, Blue, Gold, Emerald and Teal! STATUS DIE-CUT: Colorful Die-Cut parallel to the base set with 6 parallels sequentially numbered from 99 to 1! DRAFT PICKS: Chase the hottest rookies from the 2017 NFL Draft in Draft Picks! Aspirations and Status Die Cut Purple, Red, Blue, Gold, Emerald and Teal parallels are seq. #'d/99 or less! Autograph parallels are also #'d/99 or less!